1) How much is it to file? 2) Will I be able to keep my home and car? 3) How soon can I get credit again? type of creditors that you have, the experience level of your attorney and the overall practice set-up for that bankruptcy law firm. For this reason, the only number that I can actually quote is the court cost. At the time of this writing, the court cost to file a chapter 7 bankruptcy is $335. The court cost to file a chapter 13 bankruptcy is $310. The remainder of attorneys ‘ fees are going to be dictated and set by the specific lawyer. For a chapter 7 bankruptcy case, you could be looking at a range of $750 all the way to $2000 in some cases. For a chapter 13 bankruptcy case in the Northern District of Illinois, you will likely be hearing the flat fee of $4000 paid out over the life of the chapter 13 bankruptcy case. Will I be able to keep my home and car? The answer this depends on a number of different factors. For example, you have to be up to date on your payments with your house and car if you intend to keep those debts post-filing. You also have to make certain that there is not significant equity beyond the state of Illinois exemptions which would permit a chapter 7 trustee to administer the asset. Your bankruptcy attorney should be able to give you an idea of whether or not your house and car is going to be protected based upon the market value minus the outstanding debt. The difference between those two numbers is your actual equity in the piece of property. With real estate, we have to factor in a 6% cost of sale. With an auto, there is not a significant cost of sale so the equity scenario has to be pretty close to the exemption amount to be protected. We have much more leeway with a house in that there’s going to be 6% -7% of the market value of the property used as a cost of sale. This leaves less money available to the trustee to administer for the benefit of unsecured creditors. How soon can clients get credit again. The fear of being without a credit card or without having some form of installment debt scares clients. They want to get back to the lifestyle that they knew prior to filing. They want to be able to utilize credit for most of their daily purchases. This includes everything from a burger at McDonald’s to a furniture purchase to an auto loan. The good news for the clients is that there will be offers for credit likely before the case has even concluded. Creditors know that a chapter 7 bankruptcy debtor cannot utilize chapter 7 again for another eight years. For this reason, creditors will make offers to debtors to incur additional credit. The creditors are seizing upon the opportunity to have somebody on the credit hook once again for eight years, pay additional fees, and pay high interest rates. I caution my clients to very careful on what types of credit they apply for after the case is completed. In many cases, I recommend to avoid credit for the first six months to one year after filing. Once the debtor is removed at least one year from the date of filing, the credit offers seem to be more advantageous as more time passes between the filing of the bankruptcy and the application for credit. 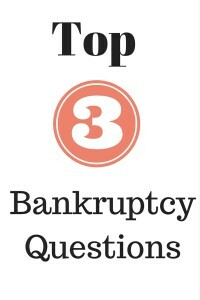 Those are the three common questions I hear more than any other questions regarding bankruptcy filing. For more information, you can contact my office directly at 847-520-8100. We have numerous offices in Chicago and the suburbs.